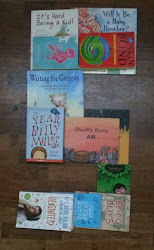 One story a day : Reliving childhood: Busy day at School! Today being a busy day at school, I read “Busy School” by Melanie Joyce and illustrated by Sue King, a Ladybird publication. It is Cilla’s first day at school and she is experiences what is known as “first day nerves”! However, as soon as she enters her class, she feels reassured by her teacher Miss Miller who helps her settle into her new environment. Miss Miller helps her find a place next to Annie and Viv who both greet her cheerfully. As the day progresses, Cilla begins to feel at ease as they move from Math to playtime and then to story time, when Cilla feels uncomfortable in the presence of a noisy Freddie. But soon she and Freddie are friends and all’s well that ends well. This book features the highs and lows of Cilla’s first day at school - something I guess Abhay could easily relate to as it was his first day at daycare too.